The highest aggregate and average crowds were once again found in the English Premier League and the German Bundesliga in 2015/16. 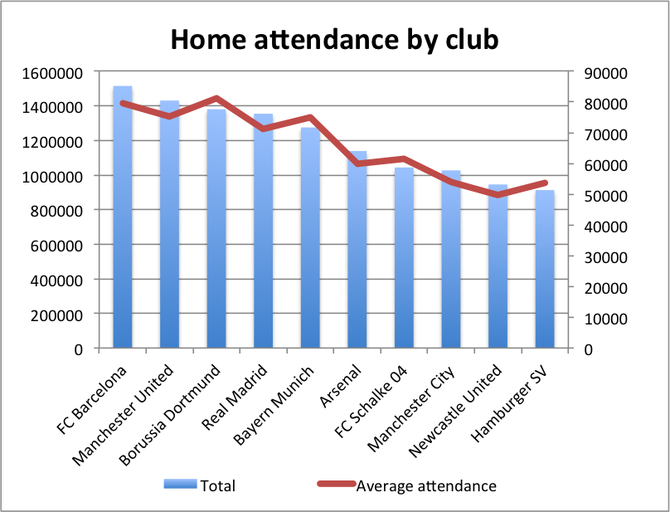 All eight clubs that recorded home match attendances of more than 1 million play in the top tier in England, Germany or Spain, and four of the top ten European leagues by total attendance were second or third-tier leagues in England, Germany and Spain, emphasising the strength and depth of supporter interest and stadium capacity in these three traditional powerhouses. 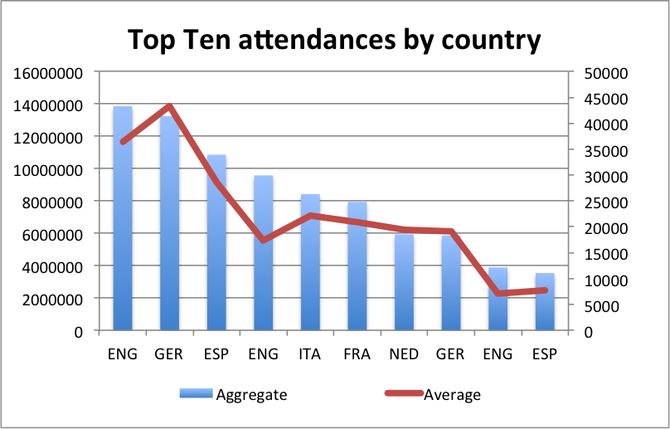 Attendances at European football matches (domestic and UEFA) exceeded 170 million in 2015/16. Including lower league attendances, German and English clubs attracted 55 million spectators between them. The trend in the top divisions was largely positive, with 34 leagues reporting increased crowds, compared with 17 that reported a drop. Combined top division attendances increased by more than 2.6 million between 2014/15 and 2015/16. 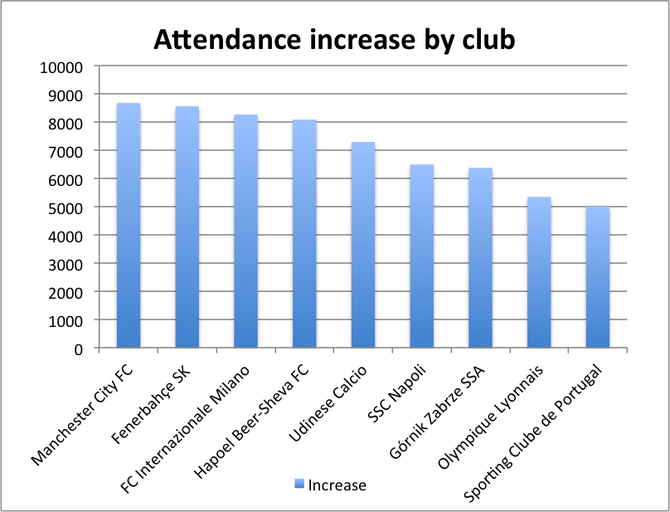 In total, 13 top-tier leagues added at least 100,000 to their total crowds between 2014/15 and 2015/16, contributing to a net top-division increase of more than 2.6 million. Nine clubs added 5,000 or more to their average season match attendance between 2014/15 and 2015/16. At the top of the list is Manchester City FC, which benefitted from increased stadium capacity, as did Udinese Calcio and Olympique Lyonnais. 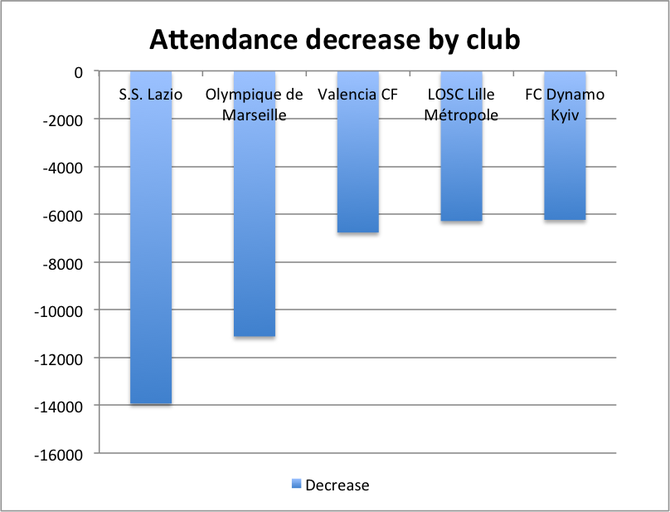 There is a clear link between average attendance trends and on-pitch performance, as measured by changes in final league position. 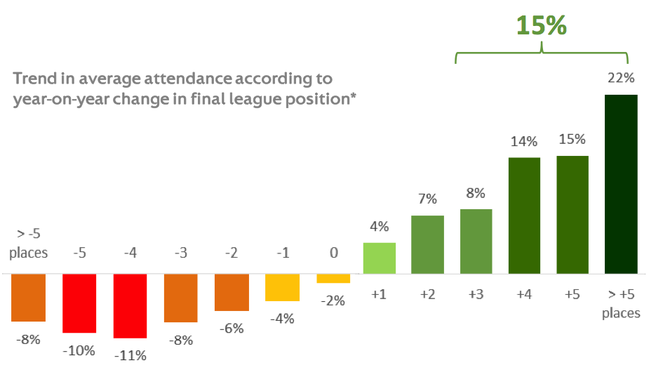 On average, moving one position up the league table added 3% to average attendance, with each position lost resulting in an equivalent 3% drop in attendance. 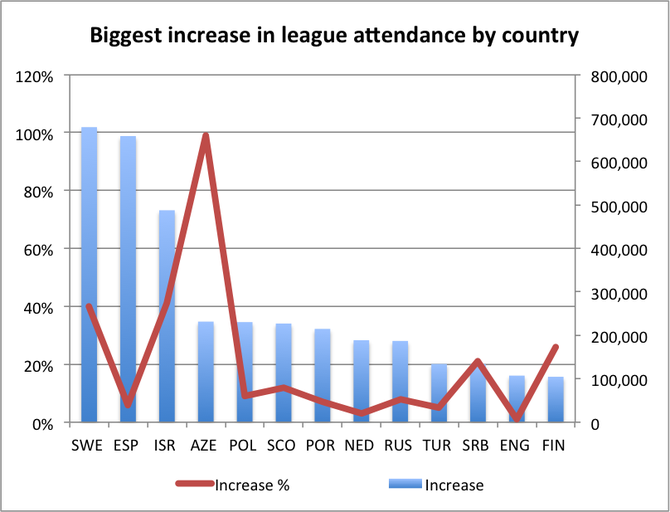 A significant improvement or deterioration in performance (moving three places or more in the table), as seen more than 2,000 times across European leagues in the last decade, has led on average to crowds increasing by 15% or decreasing by 9%.